For my "scene," I started by cutting out a few hills from the Natural paper pad from Authentique (aren't those colors perfect for hills?) I then used the Wendy Vecchi Sunburst stencil, and Wild Honey Distress Ink, to stencil the rays onto a piece of text paper (also from Authentique). The house and trees were stamped on cardstock and watercolored, using Distress Markers and a water brush. Then it was time to assemble! The hills were faux stitched and the house and trees were tucked under the hills. The last item was to add two clouds, cut out using the Clouds and Raindrop dies. The sentiment was stamped on the bottom hill. So, friends, this is going to be my last post for a while. I stepped down from the design team, for an undetermined amount of time. My hubby just received a job offer, after looking for six long months, in another state. Boo.... My craft supplies have been packed and our house in on the market so I need time to make the transition before jumping back in to regular crafting. A great BIG thank you to Korin and the wonderful SNSS design team...Love you all! And thanks to the wonderful SNSS customers who support Korin's business! Hello! 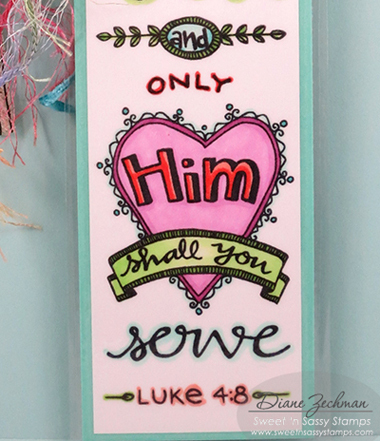 Today I am sharing this laminated bookmark that I made with one of Sweet 'n Sassy's Bible journaling stamp sets. 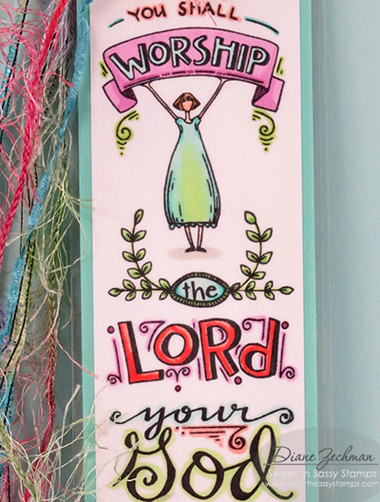 I started with the Worship the Lord stamp set and colored it with Copics. The top was punched and then it was run through a thermal laminator (Amazon had an amazing deal last year before Christmas!) I found some pretty fibers in my stash to top it off. Remember when they were all the rage? lol. So glad I didn't purge them! 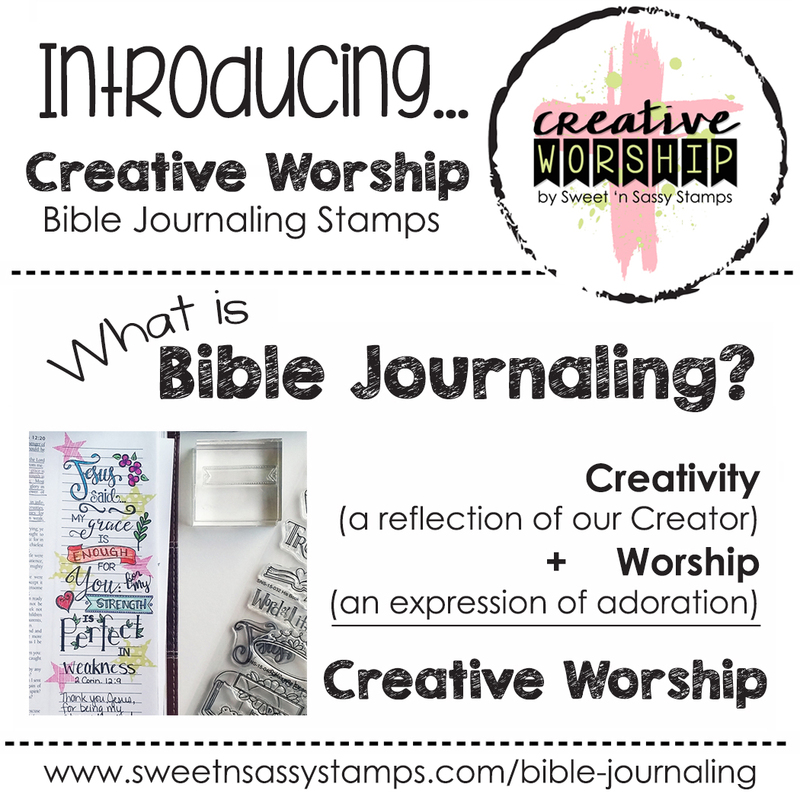 Thanks for stopping by today… happy stamping! 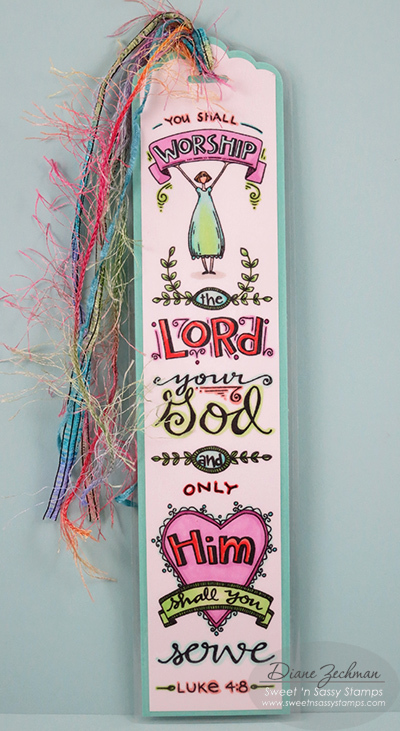 Happy Monday, Sweet Friends! Fall just seems to be the perfect time for gift making and giving--isn't it? Today, I have a fun little self opening pouch tutorial that is perfect for sharing a treat with someone special! The steps are pretty easy, but accomplish a project with lots of WOW! Along the 6” side of the card stock/designer paper, score at 1” and 5”. Rotate the card stock and score at 4” and 8”. Realign the card stock so that the left edge is at 2”. Cut from the top of the card stock to the score line. Repeat this one inch cut at 4” and 6”. Make a similar one inch cut, using trimmer or scissors, on the opposite side of the card stock at the 4” (middle) mark. Trim the ½” panel you will use to close the pouch by angle cutting and removing each corner. Using a pencil and ruler, lightly draw a diagonal line, in each panel, from the center cut line to each corner, as shown. Score each diagonal line and crease it, as shown. Trim top edge with an edge die, such as the one I've used from Bookmarks & More Dies. Place adhesive on the ½” flap and join the sides of the pouch. The pouch opens when you squeeze the sides. Decorate and fill, as desired. I used Winnie's Warm Wishes and matching dies, one of this month's Sweet Perks Club sets, to finish off my cocoa pouch. Doesn't it just make you want to have a nice warm mug of chocolate? Me too! !